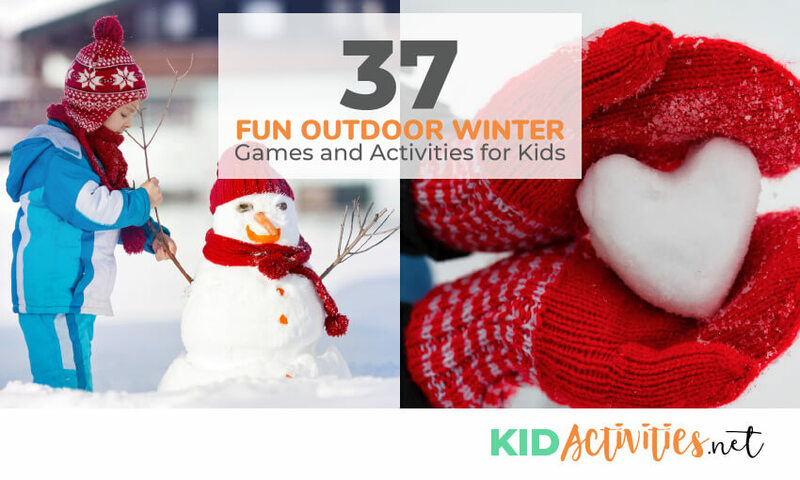 A collection of fun outdoor winter games and activities for kids. With these great winter ideas the kids will be laughing and playing in the snow for hours. Play tag as you normally would…but stepping only in others’ footprints. Set up a baseball diamond with a mound of snow representing home plate and first, second and third bases. Place an empty water bottle on the top of each mound. The pitche stands in the middle of the diamond and hurls snowballs first at home plate, then around the bases. Whoever knocks down the bottles with the fewest pitches wins. Take some time to smooth out a fairway and a green. Take an open can and plant it in the snow–this is the hole. All you need are two teams of three or more people to play, along with a spray bottle filled with a mix of water and food coloring to mark the playing field (a large rectangle with a centerline should suffice). The teams line up at opposite ends of the field (the North and South poles) for a kickoff. Once someone on the receiving team catches the ball, he tries to move it back across the defense’s goal line by running with it or passing it to a teammate. Play stops if the person with the ball is tagged by an opponent or slides out of bounds. The teams then face off again on the spot. After four tries, or a touchdown, the ball goes to the other team. The game ends when either team gets cold. 5. FIND THE SNOW FLAG! Tie a white cloth to the end of a short stick. Give each child a chance to hide it by staking it anywhere within an area with boundaries. Note how long it takes for the rest of the group to find it. Whoever hid the flag with the group that took the longest time to find it wins the game! Lightly pack a lot of basketball-size snowballs and then use them to build a course of hurdles to jump over in a round of ‘Follow the Leader’. 7. ROPE SNOW TUG…. Have you ever tried TUG OF WAR in the snow?! Fun!!! Team up for a slip-sliding variation of tug-of-war. Tamp down a wide, shallow trench in the snow to serve as the mid line. Then, take up positions at the ends of a long, thick rope and let the tugging and towing begin. Whichever team pulls the entire opposing group over to its side of the trench wins. As Frodo mentions above…Have an Olympics day with many of the activities on KidActivities. Snow hurdles, Tug of War, Relay races, etc. Have you ever tried using ‘Hula Hoops’ all bundled up in winter clothing? Have a contest to see who can last the longest! What fun in the winter-time! Play this just as you would indoors and any other time of the year. The person who is ‘It’ tags somene; that person stays frozen until another player tags him/her again to ‘unfreeze’ them. No snow? Roll up those ‘saved” pieces of white paper and pretend they’re snowballs! Make a target by creating a bright circle in the snow with colored water in a squirt bottle. First mound up snow to create three bases and a pitcher’s mound–the three mound piles should each be about 2 feet high and 20 feet apart. Next, build a tin can pyramid on each base. The challenge is to knock down the stacks in order–from first to third base by throwing snowballs from the pitcher’s mound. The child who succeeds with the fewest pitches wins. Build a plump, snowman in the yard/play-field. Make a game of taking turns trying to land a hat on his head by throwing it Frisbee style from 10 or so feet away. Freeze colored water in ice cube trays. Hide them outdoors for a wintertime SCAVENGER HUNT. This tough-to-master version of follow the leader requires 2 or more players. The leader makes a path in freshly fallen snow. His or her teammates must try to step in exactly the same spots. The object of the game is to make it seem as if only one person has taken a walk through the snow. Can you pull it off? It takes balance and agility! Be sure to bundle up to stay warm and dry. 15. WINTER TAG (NATIVE INDIAN) 5 or more players, ages 5 and up, played outdoors in the winter. Players prepare the course for the game, consisting of a maze of parts in the snow over a field or ice. The parts should be wide enough for one person to run on, about one meter wide. What follows is a simple game of tag played in lanes in the snow. Players must stay on the paths always, but the person who is ‘it’ may jump from path to path in pursuit of his opponents. Just like sand, snow is wet and dense–and can be formed into shapes. When you go outside…take out the sandbox toys, buckets, containers and molds. Create a snow castle (instead of sand castle) — Create and have fun! 17. BUILD A LARGE SNOW WORM (or Caterpillar) Great for kids-no lifting heavy snow! Use the fruit or vegetables to make eyes and a nose. Like you would with a regular snowman. Mix the food coloring in with some water and fill up a spray bottle to spray your worm with whatever color you want. (or not) A fun winter “Earth Activity”! Make Jell-O according to directions on package. Pour into clean baby food jars-one for each child. Place containers in large tub and fill the tub with snow. When Jell-O is set–enjoy! OR…MAKE IGLOO BLOCKS (OUTSIDE POPSICLE STICKS) A fun activity during winter. Have children pick their favorite drink (fruit punch, apple juice, etc) and then pour this into an ice cube tray. Have kids write their name on a popsicle stick and place it in the tray. Put this outside and let it freeze (if it is not cold enough you can put it in the freezer) The children then have an igloo block for snack. This angel is easiest made together. One partner lies down to make a snow angel while the other partner stands by to help the maker get up without messing up the imprint. After the imprint is formed, pour cups of birdseed into the angel, filling the head and body with bands of variously colored seed. For a finishing touch, add pine boughs for the angel’s spreading wings. Watch this spot daily and record your observations in a journal. The journal can be made with paper and a construction paper cover. At the same time every day, write down what the weather is like, including temperature, how the sky looks, if it is snowy or sunny and what animals you see, and how they look to you. Are they feeding? This can be a fun spectator activity! 1. Pick 2 teams. The 2 teams make a snowman bottom. 3. The 2 teams start to finish the rest of the snowman—The body, hat, nose, etc. Fill three balloons with water (one big, one medium, and one small). Let freeze overnight. Peel the balloon off and stack the balls (use salt between to help them melt and stick together. Have kids clothe him, put a carrot nose, stick arms, etc. Hide a chest full of ‘fun’ in the snow, then watch kids track it down clue by clue. Create a series of clues leading to the chest. Use either pictures from magazines or create your own with markers and paper. Place each clue in a plastic bag and hide it in the snow. Begin the hunt by handing the players their first clue. For more sophisticated players, give them their clues in riddles or use rebuses. When the temperature dips below the freezing point, many changes occur in our environment: water turns to ice, and rain turns to snow. The bubble activity demonstrates this. It’s a good idea to first chill the containers of bubble solution in the refrigerator; outside it has to be below freezing temp. Have children observe the bubbles closely as they blow. They will notice ice crystals forming on the surface of the bubbles. What happens when the bubbles pop? They shatter. If the outside weather is below 32 degrees, you can make bubbles outdoors. Blow a bubble and catch it on the wand. Wait and watch as it freezes. It will turn into a crystal ball and then shatter like glass; you’ll see ice crystals form. You’ll also notice the vibrant colors! Create a SNOWY SELF PORTRAIT that doubles as a tasty treat for animals who might stop by to admire and sample your work. 1. Start by prepping your art materials; fill the pump bottles with different hues of food-color-tinted water and cut up various fruits and vegetables. Then take the materials outside. 2. Next, start your masterpiece by lying back in the snow to make a body print. Gently rock your body to pack the print, then carefully get up (you may need a friend’s help). 3. Create a portrait by filling in the shape with the seeds and vegetable pieces and adding details with the colored water. 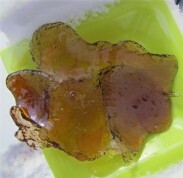 Younger children can observe how salt melts ice while creating colorful designs in large blocks of ice. 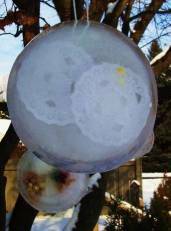 Need: Large blocks of ice, Coarse salt, Food coloring, Eye droppers This is science, art, and outside winter play! Freeze water in empty one gallon milk containers. Remove the cardboard when water is frozen. Place ice blocks on trays covered with several layers of newspaper. Sprinkle coarse salt on top of the ice blocks. Drip various colors of food coloring on top of the ice block–tunnels of color are created as the salt melts through the ice block. Put the colorful ice blocks outside. If cold enough- they should stay frozen for several days. Children can continue to examine the melting process during outdoor play. If possible-(and if they are interested) give kids their own block of ice. Make a loop with the ribbon and place it in the pie plate. Leave at least 5 inches of the looped end hanging over the edge. Fill the plate with water. If you’d like your sun catcher to be colored, add a few drops of food coloring to the water and mix it around. Add the crayon shavings, berries, or other materials for your sun catcher to the water. Put the plate in the freezer, or if it’s cold enough, leave it outside to freeze. Let the plate sit for at least one day. If it’s outside, you may need to let it sit longer. Hang the suncatcher outside from a tree or windowsill for friends and neighbors to admire. You can also try using cupcake tins and shorter ribbon (6 inches)to make several small sun catchers. Snowflakes are delicate creatures and their fine crystalline shape can vanish at the touch of warmth. You’ll need to freeze your viewing surface (keep it in the fridge or outside in a cold dry area). If the snow is falling, just hold your platform aloft to catch a few flakes and view with your magnifying glass. You may need to wear a scarf over the mouth and nose to avoid melting the flakes with a warm breath. 30. 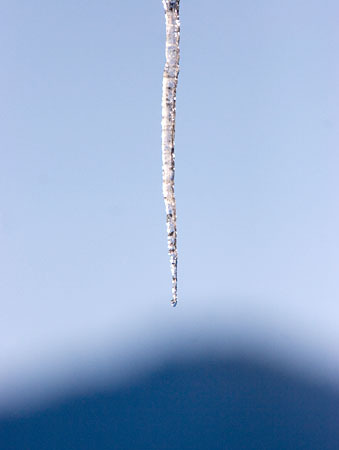 TRY MAKING YOUR OWN ICICLE! Puncture a VERY SMALL hole into a hanging container, fill it with water and then leave it slowly dripping over-night. The next day you should have your own icicle. 31. THINK ABOUT AN OUTSIDE WINTER PICNIC! Consider this for one of those all day or half day programs. You need a clear winter day. Children provide packed lunches– a hot one if they have an insulated bag. Program can provide warm drinks in thermoses. Pre-choose your picnic site. Be sure to bring blanket to sit on! When you arrive, first play a warming game like leapfrog … have your warm lunches …followed by playing more active games! This would be a great time to play relay and planned games! Weather not cooperating on the planned day? Do the same but inside!!! • Don’t just make snowmen-Make snow-women, animals, animals and super heroes! Decorate a tree for the animals in the woods or around your home or program propert. Use fruit, vegetables, nuts and peanut butter on pinecones so the animals will have food to eat when while it’s cold. Measure the length of line that you need to fit the necklace over a child’s head. Don’t forget to leave enough for tying off. Thread the needle and string the popcorn and other items alternately. Children can wear their necklace for a while and then hang the necklace onto a tree or shrub for the local wildlife. Tip: The orange peel adds a very pleasant scent. Put a bit of all natural peanut butter on the necklace before placing it outside. The oils and protein are great for the birds! Tie a piece of string around the widest part of the cone. Mix the lard and seed together, then press the mixture into the branches of the cone. Use the string to tie the cone up in a tree or bush for the birds to enjoy. (1) Wash the bottle or carton and rinse it well. Cut several small (2-3″) holes in the sides, about 2″ from the bottom. Cut or poke two small holes near the top and thread a long piece of string through them. (2) Fill the bird feeder with seeds and hang from a tree or shrub. Scattering some seeds on the ground can help the birds find the feeder. Watch the birds. Be patient. Try different types of seeds and different locations. Record your observations. There you have it, a list of outdoor winter games and activities for kids. We hope you have found some fun winter activities to keep the kids having fun this winter. If you need more winter ideas check out some of the links below. HAVE FUN WITH ALL THE WINTER PAGES!